Edsger Wybe Dijkstra (May 11 1930 – August 6 2002) was a Dutch computer scientist and an early pioneer in many research areas of computing science. Widely considered as one of the most influential members of computing science's founding generation, Dijkstra helped shape the new discipline from both an engineering and a theoretical perspective. For a number of years I have been familiar with the observation that the quality of programmers is a decreasing function of the density of go to statements in the programs they produce. More recently I discovered why the use of the go to statement has such disastrous effects, and I became convinced that the go to statement should be abolished from all "higher level" programming languages. Our intellectual powers are rather geared to master static relations and ... our powers to visualize processes evolving in time are relatively poorly developed. For that reason we should do (as wise programmers aware of our limitations) our utmost to shorten the conceptual gap between the static program and the dynamic process, to make the correspondence between the program (spread out in text space) and the process (spread out in time) as trivial as possible. Dijkstra (1968) "A Case against the GO TO Statement" cited in: Bill Curtis (1981) Tutorial, human factors in software development. p. 109. Dijkstra (1969) J.N. Buxton and B. Randell, eds, Software Engineering Techniques, April 1970, p. 16. Report on a conference sponsored by the NATO Science Committee, Rome, Italy, 27–31 October 1969. Possibly the earliest documented use of the famous quote. Dijkstra (1970) "Notes On Structured Programming" (EWD249), Section 3 ("On The Reliability of Mechanisms"), p. 5. Dijkstra (1970) "Notes On Structured Programming" (EWD249), Section 3 ("On The Reliability of Mechanisms"), p. 6. Dijkstra (1970) "Notes On Structured Programming" (EWD249), Section 3 ("On The Reliability of Mechanisms"), p. 7. Dijkstra (1970) "Notes On Structured Programming" (EWD249), Section 3 ("On The Reliability of Mechanisms"), corollary at the end. Dijkstra (1972) The Humble Programmer (EWD340). Another two years later, in 1957, I married and Dutch marriage rites require you to state your profession and I stated that I was a programmer. But the municipal authorities of the town of Amsterdam did not accept it on the grounds that there was no such profession. And, believe it or not, but under the heading “profession” my marriage act shows the ridiculous entry “theoretical physicist”! Automatic computers have now been with us for a quarter of a century. They have had a great impact on our society in their capacity of tools, but in that capacity their influence will be but a ripple on the surface of our culture, compared with the much more profound influence they will have in their capacity of intellectual challenge without precedent in the cultural history of mankind. After having programmed for some three years, I had a discussion with A. van Wijngaarden, who was then my boss at the Mathematical Center in Amsterdam, a discussion for which I shall remain grateful to him as long as I live. The point was that I was supposed to study theoretical physics at the University of Leiden simultaneously, and as I found the two activities harder and harder to combine, I had to make up my mind, either to stop programming and become a real, respectable theoretical physicist, or to carry my study of physics to a formal completion only, with a minimum of effort, and to become....., yes what? A programmer? But was that a respectable profession? For after all, what was programming? Where was the sound body of knowledge that could support it as an intellectually respectable discipline? I remember quite vividly how I envied my hardware colleagues, who, when asked about their professional competence, could at least point out that they knew everything about vacuum tubes, amplifiers and the rest, whereas I felt that, when faced with that question, I would stand empty-handed. Full of misgivings I knocked on van Wijngaarden’s office door, asking him whether I could “speak to him for a moment”; when I left his office a number of hours later, I was another person. For after having listened to my problems patiently, he agreed that up till that moment there was not much of a programming discipline, but then he went on to explain quietly that automatic computers were here to stay, that we were just at the beginning and could not I be one of the persons called to make programming a respectable discipline in the years to come? This was a turning point in my life and I completed my study of physics formally as quickly as I could. One moral of the above story is, of course, that we must be very careful when we give advice to younger people; sometimes they follow it! Dijkstra (1972) "Structured Programming", Chapter title in O.J. Dahl, E.W. Dijkstra, and C.A.R. Hoare. Academic Press, 1972 ISBN 0122005503. Dijkstra (1973) in personal communication to Donald Knuth, quoted in Knuth's "Structured Programming with go to Statements". Dijkstra (1975) Comments at a Symposium (EWD 512). Dijkstra (1978) The pragmatic engineer versus the scientific designer (EWD 690). Dijkstra (1979) My hopes of computing science (EWD 709). Brainpower is by far our scarcest resource. 1972 Turing Award Lecture, Communications of the ACM 15 (10), October 1972: pp. 859–866. As a result of a long sequence of coincidences I entered the programming profession officially on the first spring morning of 1952, and as far as I have been able to trace, I was the first Dutchman to do so in my country. We must not forget that it is not our [computing scientists'] business to make programs, it is our business to design classes of computations that will display a desired behaviour. The major cause [of the software crisis] is that the machines have become several orders of magnitude more powerful! To put it quite bluntly: as long as there were no machines, programming was no problem at all; when we had a few weak computers, programming became a mild problem, and now we have gigantic computers, programming has become an equally gigantic problem. In this sense the electronic industry has not solved a single problem, it has only created them, it has created the problem of using its products. FORTRAN's tragic fate has been its wide acceptance, mentally chaining thousands and thousands of programmers to our past mistakes. Using PL/1 must be like flying a plane with 7000 buttons, switches and handles to manipulate in the cockpit. Compare more succinct phrasings cited above. How do we tell truths that might hurt? (numbered EWD498, written 1975) was written as a series of aphorisms, and is the source of several popular quotations. It was also published in Selected Writings on Computing: A Personal Perspective. Dijkstra (1982) as cited in: Douglas Schuler, Douglas Schuler Jonathan Jacky (1989) Directions and Implications of Advanced Computing, 1987. Vol 1, p. 84. Dijkstra (1984) Source: The threats to computing science (EWD898). Dijkstra (1984) The threats to computing science (EWD898). Dijkstra (1984) On the nature of Computing Science (EWD896). Dijkstra (1985) Where is Russell's paradox? (EWD 923A). A confusion of even longer standing came from the fact that the unprepared included the electronic engineers that were supposed to design, build and maintain the machines. The job was actually beyond the electronic technology of the day, and, as a result, the question of how to get and keep the physical equipment more or less in working condition became in the early days the all-overriding concern. As a result, the topic became – primarily in the USA – prematurely known as ‘computer science’ – which, actually, is like referring to surgery as ‘knife science’ – and it was firmly implanted in people’s minds that computing science is about machines and their peripheral equipment. Quod non [Latin: "Which is not true"]. We now know that electronic technology has no more to contribute to computing than the physical equipment. We now know that programmable computer is no more and no less than an extremely handy device for realizing any conceivable mechanism without changing a single wire, and that the core challenge for computing science is hence a conceptual one, viz., what (abstract) mechanisms we can conceive without getting lost in the complexities of our own making. Dijkstra (1986) On a cultural gap (EWD 924). Dijkstra (1986) Visuals for BP's Venture Research Conference (EWD 963). Dijkstra (1988) "On the cruelty of really teaching computing science (EWD1036). As economics is known as "The Miserable Science", software engineering should be known as "The Doomed Discipline", doomed because it cannot even approach its goal since its goal is self-contradictory. (...) Software engineering has accepted as its charter "How to program if you cannot. Dijkstra (1993) "From my Life" (EWD 1166). Dijkstra (1994) "The strengths of the academic enterprise" (EWD 1175). Dijkstra (1995) "Introducing a course on calculi" (EWD 1213). It is time to unmask the computing community as a Secret Society for the Creation and Preservation of Artificial Complexity. Dijkstra (1996) "The next fifty years" (EWD 1243a). Industry suffers from the managerial dogma that for the sake of stability and continuity, the company should be independent of the competence of individual employees. Hence industry rejects any methodological proposal that can be viewed as making intellectual demands on its work force. Since in the US the influence of industry is more pervasive than elsewhere, the above dogma hurts American computing science most. The moral of this sad part of the story is that as long as computing science is not allowed to save the computer industry, we had better see to it that the computer industry does not kill computing science. Dijkstra (1999) "Computing Science: Achievements and Challenges" (EWD 1284). May, in spite of all distractions generated by technology, all of you succeed in turning information into knowledge, knowledge into understanding, and understanding into wisdom. Dijkstra (2000) "Answers to questions from students of Software Engineering" (EWD 1305). Dijkstra (2000), "Answers to questions from students of Software Engineering" (EWD 1305). What is the shortest way to travel from Rotterdam to Groningen, in general: from given city to given city. It is the algorithm for the shortest path, which I designed in about twenty minutes. One morning I was shopping in Amsterdam with my young fiancée, and tired, we sat down on the café terrace to drink a cup of coffee and I was just thinking about whether I could do this, and I then designed the algorithm for the shortest path. As I said, it was a twenty-minute invention. In fact, it was published in ’59, three years late. The publication is still readable, it is, in fact, quite nice. One of the reasons that it is so nice was that I designed it without pencil and paper. I learned later that one of the advantages of designing without pencil and paper is that you are almost forced to avoid all avoidable complexities. Eventually that algorithm became, to my great amazement, one of the cornerstones of my fame. This is generally true: any sizeable piece of program, or even a complete program package, is only a useful tool that can be used in a reliable fashion, provided that the documentation pertinent for the user is much shorter than the program text. If any machine or system requires a very thick manual, its usefulness becomes for that very circumstance subject to doubt! Dijkstra, "On the reliability of programs" (EWD 303). The precious gift that this Turing Award acknowledges is Dijkstra's style: his approach to programming as a high, intellectual challenge; his eloquent insistence and practical demonstration that programs should be composed correct, not just debugged into correctness; and his illuminating perception of problems at the foundations of program design. M.D. Mcllroy (1972) at the presentation of the lecture on August 14, 1972, at the ACM Annual Conference in Boston, cited in E.G. Dijkstra (1972) "The Humble Programmer". 1972 ACM Turing Award Lecture. in: Communications of the ACM 15 (10), October 1972: pp. 859–866. A revolution is taking place in the way we write programs and teach programming, because we are beginning to understand the associated mental processes more deeply. It is impossible to read the recent [E. W. Dijkstra, O.-J. Dahl, and C. A. R. Hoare] book Structured Programming, without having it change your life. The reason for this revolution and its future prospects have been aptly described by E.W. Dijkstra in his 1972 Turing Award Lecture, The Humble Programmer. Donald Knuth (1974), in Structured Programming with Go To Statements. (Computing Surveys 6 (4): 261–301). The working vocabulary of programmers everywhere is studded with words originated or forcefully promulgated by E. W. Dijkstra—display, deadly embrace, semaphore, go-to-less programming, structured programming. But his influence on programming is more pervasive than any glossary can possibly indicate. David Gries (1978), in Programming Methodology: A Collection of Articles by Members of IFIP WG2.3 (New York: Springer Verlag), p. 7. Edsger W. Dijkstra's 1969 "Structured Programming" article precipitated a decade of intense focus on programming techniques that has fundamentally altered human expectations and achievements in software development. Before this decade of intense focus, programming was regarded as a private, puzzle-solving activity of writing computer instructions to work as a program. After this decade, programming could be regarded as a public, mathematics-based activity of restructuring specifications into programs. Before, the challenge was in getting programs to run at all, and then in getting them further debugged to do the right things. After, programs could be expected to both run and do the right things with little or no debugging. Before, it was common wisdom that no sizable program could be error-free. After, many sizable programs have run a year or more with no errors detected. These expectations and achievements are not universal because of the inertia of industrial practices. But they are well-enough established to herald fundamental change in software development. The difference between a computer programmer and a computer scientist is a job-title thing. Edsgar Dijkstra wants proudly to be called a "computer programmer," although he hasn't touched a computer now for some years. (...) His great strength is that he is uncompromising. It would make him physically ill to think of programming in C++. Donald Knuth (1996), in an interview by Jack Woehr of Dr. Dobb's Journal. You probably know that arrogance, in computer science, is measured in nanodijkstras. Alan Kay, keynote speech at OOPSLA 1997 (video). ...I also discovered books of two great computer scientists from whose work I learned the scientific foundation of my trade: Donald Knuth and Edsger Dijkstra. Knuth taught me the answers. Dijkstra taught me the questions. Time and time again I come back to their works for new insights. Alexander Stepanov (1997), in an interview with Graziano Lo Russo of Edizioni Infomedia srl. The first classic is one of the great works in computer programming: E. W. Dijkstra, Cooperating Sequential Processes (1965). Here Dijkstra lays the conceptual foundation for abstract concurrent programming. The Edsger W. Dijkstra Prize in Distributed Computing is named for Edsger Wybe Dijkstra (1930-2002), a pioneer in the area of distributed computing. His foundational work on concurrency primitives (such as the semaphore), concurrency problems (such as mutual exclusion and deadlock), reasoning about concurrent systems, and self-stabilization comprises one of the most important supports upon which the field of distributed computing is built. No other individual has had a larger influence on research in principles of distributed computing. The prize is given for outstanding papers on the principles of distributed computing, whose significance and impact on the theory and/or practice of distributed computing have been evident for at least a decade. Most experienced IT professionals will agree that developing and adhering to a standard architecture is key to the success of large-scale software development. Computer pioneer Edsger Dijkstra validated this notion when he developed THE operating system in 1968. Since then, layered architectures have proved their viability in technological domains, such as hardware and networking. Layering has proved itself in the operating system domain; however, the same benefits are available when applied to e-commerce or to thin client–oriented applications. Layered architectures have become essential in supporting the iterative development process by promoting reusability, scalability, and maintainability. Edsger Dijkstra, one of the giants of our field and a passionate believer in the mathematical view of programs and programming (...) Over the previous quarter-century, he had formulated many of the great intellectual challenges of the field as programming—the goto statement, structured programming, concurrent processes, semaphores, deadlocks, recursive programming in Algol, and deriving correct programs. Of great influence to Pascal was Structured Programming, put forth by E. W. Dijkstra. This method of proceeding in a design would obliviously be greatly encouraged by the use of a Structured Language, a language with a set of constructs that could freely be combined and nested. The textual structure of a program should directly reflect its flow of control. In 1965 Dijkstra wrote his famous Notes on Structured Programming and declared programming as a discipline in contrast to a craft. Also in 1965 Hoare published an important paper about data structuring. These ideas had a profound influence on new programming language, in particular Pascal. Languages are the vehicles in which these ideas were to be expressed. Structured programming became supported by a structured programming language. The revolution in views of programming started by Dijkstra's iconoclasm led to a movement known as structured programming, which advocated a systematic, rational approach to program construction. Structured programming is the basis for all that has been done since in programming methodology, including object-oriented programming. As the first book on the topic [Structured Programming by Dijkstra, Ole-Johan Dahl, and Tony Hoare] shows, structured programming is about much more than control structures and the goto. Its principal message is that programming should be considered a scientific discipline based on mathematical rigor. Bertrand Meyer (2009), in Touch of Class: Learning to Program Well with Objects and Contracts. (Springer), p. 188. Since the early work of E.W. Dijkstra (1965), who introduced the mutual exclusion problem, the concept of a process, the semaphore object, the notion of a weakest precondition, and guarded commands (among many other contributions), synchronization is no longer a catalog of tricks but a domain of computing science with its own concepts, mechanisms, and techniques whose results can be applied in many domains. This means that process synchronization has to be a major topic of any computer science curriculum. Michel Raynal (2013), in Concurrent Programming: Algorithms, Principles, and Foundations (Springer), p. vi. 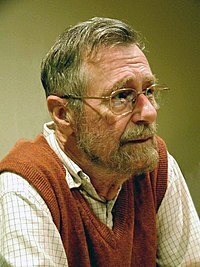 Although Dijkstra will always be remembered for structured programming, and for his style and approach, he also invented many other of the standard ideas of programming. If you are struggling with multi-threaded programming you may have encountered the semaphore, and the idea of the "deadly embrace". These, and more, are the result of Dijkstra's work on concurrent programming. He showed how this particularly difficult area of programming could be made relatively safe. While concurrent program execution had been considered for years, the computer science of concurrency began with Edsger Dijkstra's seminal 1965 paper that introduced the mutual exclusion problem. (...) The first scientific examination of fault tolerance was Dijkstra's seminal 1974 paper on self-stabilization. (...) The ensuing decades have seen a huge growth of interest in concurrency—particularly in distributed systems. Looking back at the origins of the field, what stands out is the fundamental role played by Edsger Dijkstra, to whom this history is dedicated. We generally trace the idea of building computer systems in layers back to a 1967 paper that the Dutch computer scientist Edsger Dijkstra gave to a joint IEEE Computer Society/ACM conference. Prior to this paper, engineers had struggled with the problem of how to organize software. If you look at early examples of programs, and you can find many in the electronic library of the Computer Society, you will find that most code of that era is complicated, difficult to read, hard to modify, and challenging to reuse. In his 1967 paper, Dijkstra described how software could be constructed in layers and gave an example of a simple operating system that used five layers. He admitted that this system might not be a realistic test of his ideas but he argued that the "larger the project, the more essential the structuring!" The idea of using layers to control complexity has become a mainstay of software architecture. We see it in many forms and apply it to many problems. We see it in the hierarchy of classes in object-oriented programming and in the structure of Service-Oriented Architecture (SOA). SOA is a relatively recent application of layering in computer science. It was articulated in 2007 as a means of controlling complexity in business systems, especially distributed systems that make substantial use of the Internet. Like Dijkstra's plan for system development, its layering system is called the SOA Solution Stack or S3. The S3's nine layers are: 1) operational systems, 2) service components, 3) services, 4) business processes, 5) consumer actions, 6) system integration, 7) quality control and assurance, 8) information architecture, and 9) system governance and policies. Possibly folklore. See Computer science#Disputed. Dijkstra sent a paper to Communications of the ACM under the title of "A Case against the GO TO Statement" (EWD215, PDF here). However the editor Niklaus Wirth decided to publish it as a letter to the editor to speed up publication. Wirth changed the title to "The goto statement considered harmful". Dijkstra explains it himself in EWD1308 (see near the end of the article).